Welcome to Today@WKU, the daily newsletter from WKU Public Affairs, for December 12, 2018. 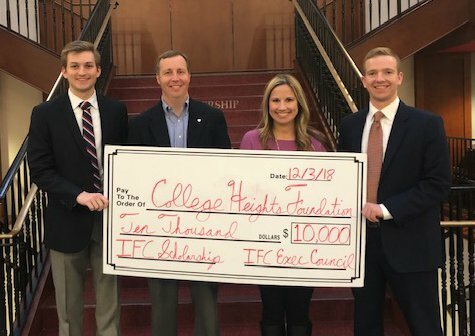 WKU Interfraternity Council establishes scholarship fund to benefit members of Greek fraternities: WKU’s Interfraternity Council (IFC) recently voted to establish an endowed scholarship fund in the College Heights Foundation at WKU. IFC is the governing body for WKU’s 14 social fraternities on campus and seeks to provide an environment that enriches the campus and aids in the development of gentlemen and the Greek community. Senior impacts community through ENACTUS: Graduating senior Hope Thompson, a Strategic Marketing major from Birmingham, Alabama, has made her mark within the Gordon Ford College of Business through networking and getting involved. Her role with the WKU ENACTUS entrepreneurship team has enabled her to make a tangible impact on the Bowling Green community. WKU Habitat for Humanity Campus Chapter to spend week in Oklahoma City: Members of the WKU Habitat for Humanity Campus Chapter will be spending the first week of their winter break in Oklahoma City, Oklahoma. The WKU group will be working Dec. 15-22 on new construction and renovation projects with Central Oklahoma Habitat for Humanity as part of Habitat’s efforts to eliminate substandard housing. Winter Break Parking Lot Closures and Energy Conservation: In order to maximize energy savings initiatives, lights will be turned off in low use parking lots during Winter Break (Dec. 16-Jan. 1). “LOT CLOSES AT DUSK” signs will be placed at the entrance of these lots. What’s Happening at WKU: Check out a list of events through Jan. 19. Football: Hardesty, Owens and Chestnut Added to WKU Coaching Staff: Three more additions to Tyson Helton's first coaching staff on The Hill have been announced as Montario Hardesty (running backs), Richard Owens (tight ends), Chris Chestnut (wide receivers) have joined the program. National Geographic Society Names Dr. Vicki Phillips Chief Education Officer: The National Geographic Society announced the appointment of nationally recognized educator and WKU graduate Dr. Vicki Phillips to the new role of chief education officer, effective Jan. 21, 2019. In this capacity, Phillips will lead the Society’s ambitious education agenda in the United States and internationally, which includes student experiences, classroom resources and professional development opportunities for educators. 'Bingocize' Created by WKU Professor Approved by National Council on Aging for Falls Prevention: A program called ‘Bingocize’ created by WKU Associate Professor of Exercise Science Jason Crandall has received approval from the National Council on Aging for use in helping older adults prevent falls. Bingocize takes advantage of bingo's popularity with older adults to intergrate exercise and health education into the game.